This open heart standing spray is a perfect symbol of your sympathy and support. 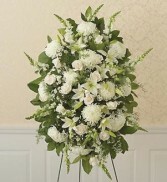 Softly colored flowers such as delphinium, mums, and heather are accented with soft wildflowers Sent directly to the funeral home by family, friends and business associates Our florists use only the freshest flowers available so colors and assortment may vary Measures approximately 28"H x 27"W without easel. 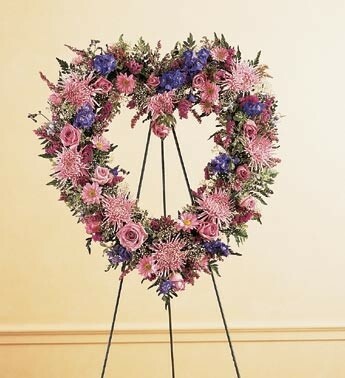 This Open Heart Standing Spray Is A Perfect Symbol Of Your Sympathy And Support, Softly Colored Flowers Such As Delphinium, Mums, And Heather Are Accented With Soft Wildflowers, Sent Directly To The Funeral Home By Family, Friends And Business Associates, Our Florists Use Only The Freshest Flowers Available So Colors And Assortment May Vary, Measures Approximately H X W Without Easel. 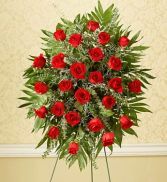 Express Your Love And Support At This Time Of Loss With This Unforgettable Tribute, Features Roses, Caspia, Salal And More, A Fitting Memorial For Families, Friends, Or Business Associates To Send, Traditionally Sent To The Funeral Home, Available In Your Choice Of Red, Peach, Pink, White, Yellow, Or Multicolored Roses, If First Choice Rose Color Is Unavailable, Multicolored Roses Will Be Substituted, Due To The Urgency Of The Occasion, Our Florists Use The Freshest Flowers Available, So Components May Vary, Arrangement Measures Approximately H X D.
Send Your Deepest Wishes Of Sympathy In An Elegant And Beautiful Way With Our Allwhite Standing Spray, Crafted On A Striking Easel Using The Freshest Available Roses, Mums, Snapdragons, Lilies And More, Its A Gorgeous Tribute At Times Of Loss, This Type Of Standing Spray Arrangement Is Traditionally Sent Directly To The Funeral Home By Family Members Or Friends, Due To The Urgency Of The Occasion Our Florists Use Only The Freshest Flowers Available, So Components May Vary, Small Measures Approximately H X D Without Stand, Medium Measures Approximately H X D Without Stand, Large Measures Approximately H X D Without Stand.